Dr. Guerrero-Thompson's contributions to education and to the Austin community are unequaled. She taught high school in AISD for 17 years, before being asked to coordinate the central administrative office and school principals' efforts to implement state requirements for gifted and talented education in secondary schools. She then went on to the University of Texas School of Business where she developed and implemented programs for recruitment and retention of hispanic and african-american high school students. Dr. Guerrero-Thompson went on to TEA where she managed a field study that implemented high-quality professional development and technical support at 17 middle school campuses across Texas. At the Dana Center, Dr. Guerrero-Thompson managed all communications and external relations for a university research center. In 2003, Janis became the Executive Director of Planning and Community Relations for AISD. Dr. Guerrero-Thompson was a native Austinite and an active volunteer for her community and church. She served as Vice Chair of the Board of Directors of Central Texas Goodwill Industries, and served as President of the Board of Directors for Executive Women in Texas Government. She served as Chair of the City of Austin's Civil Service Commission, and on Advisory Boards of the Seedling Foundation and the United Way Hispanic Community Initiative. She was an active volunteer in Chaplain Services at Brackenridge Hospital, and in the Ministry for the Homebound at St. Mary Cathedral. In June 2004, Hispanic Magazine recognized Dr Guerrero-Thompson as a Top Latina in Community Service. 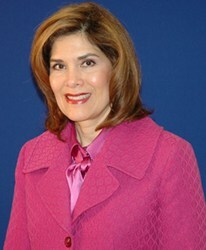 In February 2008, La Voz de Austin, Austin Community College, and the Texas Association of Chicanos in Higher Education honored Dr Guerrero-Thompson as one of 25 most influential hispanics in Austin.